Educational-technology startup Byju's said on Tuesday it has raised $75 million (about Rs 500 crore) from Sequoia India and Belgian investment firm Sofina. The company will use the funds to expand its product pipeline, deliver content in a new format, enter new markets and increase its staff strength. "Today, we have products predominantly in math and science. We aim to add other subjects. We also aim to target more grades," said founder and CEO Byju Raveendran. "We will expand to key English-speaking international markets and customise our content for other geographies." Raveendran founded the startup in 2011. It offers learning programmes through its app for Class 6 to 12 and test preparation for engineering, medical and other competitive exams. The learning app was launched in 2015. Before launching the app, Raveendran conducted teaching workshops at auditoriums. He later conducted live online video tutorials as well. "Byju and his team are pushing the boundaries for how immersive media and technology can deliver superior education for millions of students, anywhere and anytime," said GV Ravishankar, managing director, Sequoia Capital India Advisors. The startup, owned by Think and Learn Pvt Ltd, had in 2013 raised Rs 50 crore (about $9 million) from Aarin Capital and former Infosys finance chief TV Mohandas Pai, according to VCCEdge, the data-research platform of VCCircle. Byju's provides students personalised instruction, feedback and assessment using pedagogical methods, data science and machine learning. It has a 500-member R&D team working across three specialised verticals: a content creation team drawn from IIT and IIM graduates, a media production house that transforms the content into interactive experiences and a technology team that builds an adaptive platform to give each learner a personalised experience. The firm is also piloting a one-on-one mentoring model for students who need additional learning support. The mentors will be provided data to help them understand a pupil's progress. 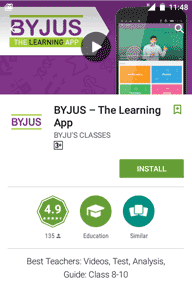 Byju's follows a freemium model. It first offers users its content for free for a few weeks and then provides them the option to pay. "Our year-on-year retention rate is close to 90 per cent, which means that students are learning on their own and parents are buying it [the content] for them again and again," said Raveendran. Currently, 50 per cent of Byju's app usage comes from outside the top 10 cities in India. The app has clocked 2.5 million downloads till date with close to 120,000 annual paid users. Raveendran said that the company is adding close to 20,000 paid users a month. The past two months have seen considerable activity in the ed-tech segment. Earlier this month, financial services and analytics education startup Imarticus Learning raised $1 million (around Rs 6.7 crore) from a group of investors including VC fund Blinc Advisors. Also in February, Hyderabad-based Next Education India Pvt Ltd acquired Mumbai-based InOpen Technologies Pvt Ltd, a firm that develops educational content and teacher training solutions. Mohandas Pai and Aarin Capital seed-funded ed-tech startup Oust Labs Inc., which helps students prepare for competitive exams using mobile gaming technology. In January, Jaipur-based EduCommerce Technologies Pvt Ltd, which runs mobile-based education startup Myly, raised $100,000 (about Rs 67 lakh) in seed funding from Newbie Promoter Pvt Ltd.
Sequoia is one of the most active venture capital firms in India, having struck 54 deals in 2015. The VC firm's most recent investment was in Mumbai-based Rakyan Beverages Pvt Ltd, which sells fresh cold-pressed juices under the RAW Pressery brand. Sofina had last year invested in Practo and Gurgaon-based Hector Beverages Pvt Ltd.